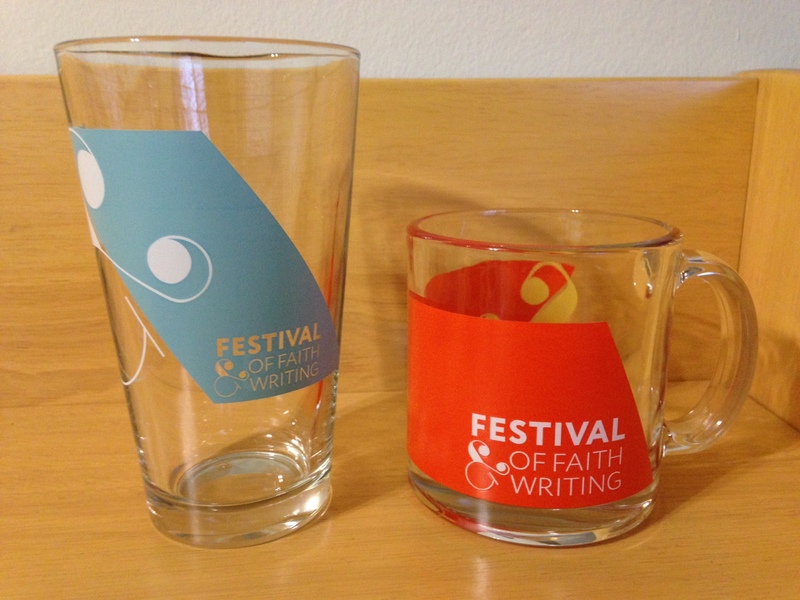 Some more souvenirs from this year’s FFW. Jaweed Kaleem said coverage of Islam by the U.S. media vastly increased after 9/11. (He was in high school at the time, only 20 minutes from the Pentagon, and wrote for his school newspaper.) “We have to cover bad news, but also be accurate and balanced” and “proportional,” he said. He likes to report positive stories, such as interfaith dialogue and “positive solutions to the world’s problems.” Kaleem noted that “It’s not just Islam that has coverage problems,” and “there should be more people of all kinds in the media,” although they don’t necessarily need to share the faith of the people they report on. In fact, he noted that as a Muslim, he learned a lot about Catholicism by covering it. (I found that to be true for me as well, as a Christian who did stories on Islam and Buddhism in graduate school.) He also wanted journalists to pay attention to diversity among American Muslims regarding race and their level of observance. Patton Dodd and Bob Smietana shared how Facebook and blogs have changed how people consume and create news and also emphasized the need for neutral mainstream coverage of religion (as opposed to publications affiliated with particular religious groups). Dodd called Facebook “our front page,” where audiences see stories selected by algorithms as well as curators. Smietana said Facebook is “a great sharing mechanism,” and he noted that the Internet and blogs make information on religious scandals much more available to journalists and the public now than in previous decades. Maria Ebrahimji said she did not tell her newsroom colleagues about her Muslim faith until after 9/11, and that others also didn’t discuss their own beliefs until she started doing so. Since “religion intersects so many aspects of life,” she wants to “make faith part of the conversation” and believes “people want to talk about their faith.” I’ve found that to be true when I’ve interviewed people of various religious backgrounds. And although I’m younger than Ebrahimji, I usually felt relatively comfortable discussing my own faith with my colleagues and classmates, and many of them were not shy about mentioning theirs as well. It’s no secret that the news business is in dire straits financially and has been for some time. (Who knows how the latest news will play out?) That affects what gets covered, and how. Dodd made a strong case that nonprofits such as ProPublica could be part of the solution by encouraging “media work that’s missional,” protecting not just “the integrity of journalism” but the role of journalists as “curators of the attentional commons, what people give their time and minds to.” He did note that there is sometimes “a challenging exercise to keep independence” with nonprofits, and that “great journalism should be the goal.” He cited sports journalism as one area that could benefit from a nonprofit approach that puts more distance between news outlets and the major college and professional leagues. Looking ahead to FFW 2018, I hope there is even more fruitful discussion of journalism. No matter what happens in the industry in the next two years, there should be plenty to talk about. When you’re Anglican, “reader” has multiple meanings. Nadia Bolz-Weber was just as hilarious and inspiring as I had hoped. Several lines from her lecture (sermon?) hit home with me and will influence how I write in the future: “I try to preach from my scars and not my wounds” and “The things we say in church are true, but rarely honest.” She also insisted she’s not really a writer, just “a talker with a laptop,” but I would beg to differ. Speaking of Islam, that was also a huge topic at this FFW, which I appreciated. I counted at least five Muslim speakers on the schedule, who discussed both their own faith and how it intersects with others. I was disheartened listening to Bob Smietana and Maria Ebrahimji describe their experiences covering hate crimes and other bigotry against Muslims in the U.S., but I was encouraged by how many people at Kaleem’s individual session sought to learn more about Islam and wanted to educate others about it, and by Dennis Covington‘s appeal for understanding as he recounted his time alongside Muslims — and secular European aid workers — in Syria helping those who’ve suffered horribly during the conflict in that country. While I was chatting with Doug Kindschi, who introduced Kaleem, I found out that Grand Rapids now has five mosques. I’m glad my old church is making an effort to reach out to that community, and I hope other Christians do the same. I made a point of attending sessions by Tish Harrison Warren and the hilarious Preston Yancey because we all belong to the same denomination: the Anglican Church in North America. Considering the ACNA is only seven years old and still relatively small, it was remarkable to me to have that big a contingent. 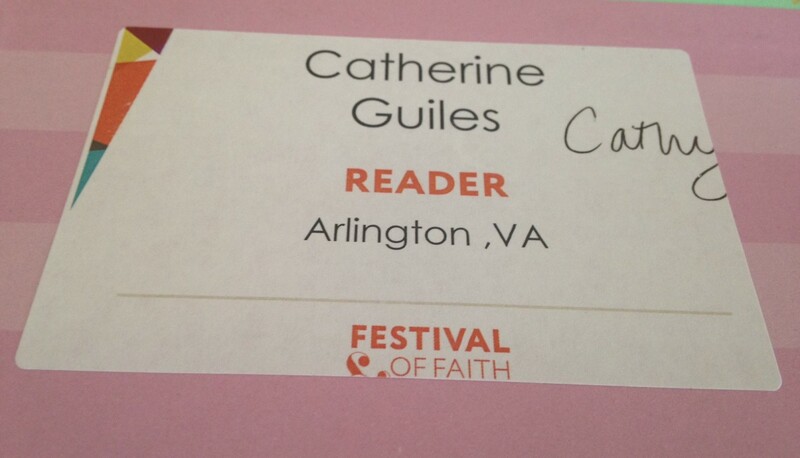 (I laughed a little when I got my FFW name tag saying “Reader,” since that’s a role I sometimes play at my church: reading Scripture out loud during the service.) I’m sorry I missed Laura Turner, who is not Anglican, but who wrote a great article about someone who is. I also have quite a few friends at my church who are Calvin grads, which isn’t surprising: I think the Reformed and Anglican traditions both appeal to intellectual-type Christians, of which I hope I am one. There’s something special about hearing writers read their own work aloud. Covington’s Southern accent perfectly matched his accounts of snake handling, and Joshua Max Feldman cracked me up with his reading of the encounter between Jonah and a Hasidic Jew on the subway in “The Book of Jonah.” I’d also listen to Chigozie Obioma read just about anything in his beautiful Nigerian accent. There’s also something special about print books as opposed to e-readers. No. 1, you can have authors sign them, as I did several times. And No. 2, you can see what other people are reading. I overheard a young woman tell Bessey that she likes to read “Jesus Feminist” on airplanes because it sparks discussions — which I think all good writing should do. For more takes on the FFW, check out The Twelve, The Post Calvin, Sick Pilgrim and Aleteia. 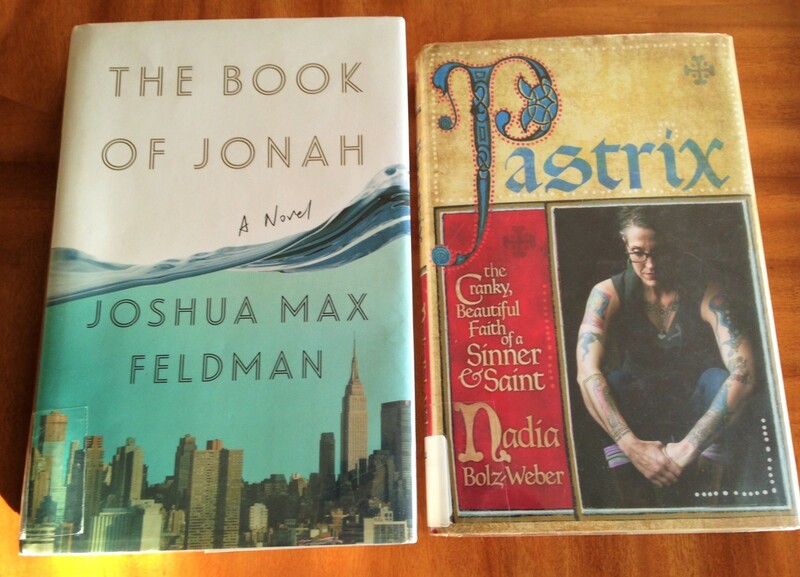 Some of my pre-Festival reading. I recommend both. If it’s April in an even-numbered year, that means it’s time for the Festival of Faith and Writing at my undergraduate alma mater, Calvin College. I attended my first Festival as a freshman, way back in 2000. I loved it so much that I served on the event’s student committee my junior year, in 2002, and I’ve been to most of the Festivals ever since. I’m always excited for three days of seeing old friends and professors, hearing authors I love and discovering new favorites, and being re-inspired to write and read. However, I know this year’s event will be a little sad for me because it’s the first one since Dale Brown, one of my favorite Calvin professors — and the co-creator and longtime director of the Festival — died in 2014. The event really wouldn’t be what it is today without him, and even amid my sadness, I’m happy to see his work continue. I’m especially excited for the launch of the Calvin Center for Faith and Writing — one of those things that when I heard about it, I thought, “Why didn’t we have this already?” But, now we do — and I can’t wait to see what comes out of it. Those last five are all journalists (past and/or present), which, if you know me, shouldn’t be a surprise. But, I expect all these speakers to be great, regardless of genre — and to come home with an even longer reading list. If you’ll be at the Festival too, drop me a line! I’d love to meet up with you.